When I worked in Flatiron, I visited just about every decent restaurant in the neighborhood. I can tell you where to get the best lunch special in New York City (Chote Nawab, obviously) and where to find the best Korean buffet (Woorijip, hands down). I can even tell you what the most optimal conditions are for snagging a ShackBurger in Madison Square Park, wait-free (when it’s raining, duh!). But, until this morning, I couldn’t tell you where to find a Taylor Ham, egg, and cheese sandwich on a fresh-baked bun in all of the big apple. All this time, pork roll was right around the corner — and I had no idea. 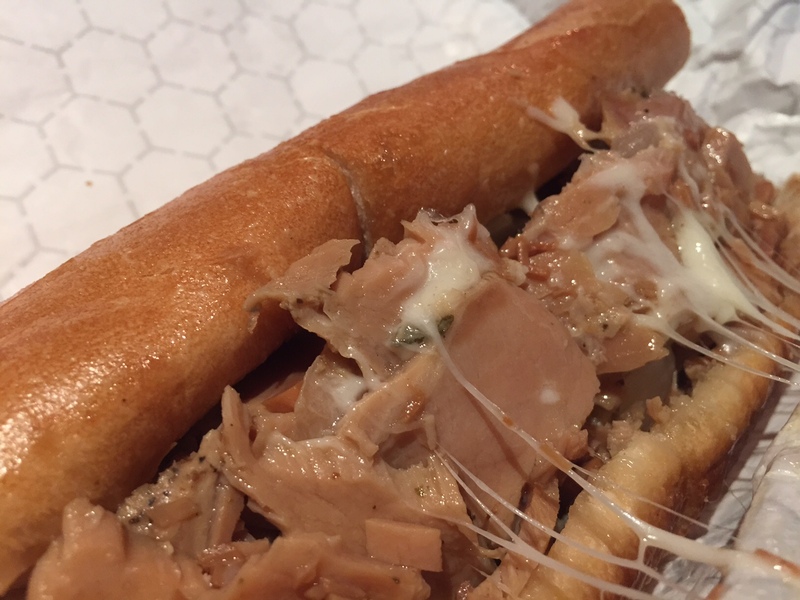 The self-proclaimed purveyor of “NYC’s only authentic cheesesteak,” Shorty’s prides itself on serving up South Philly cuisine (at South Philly prices). 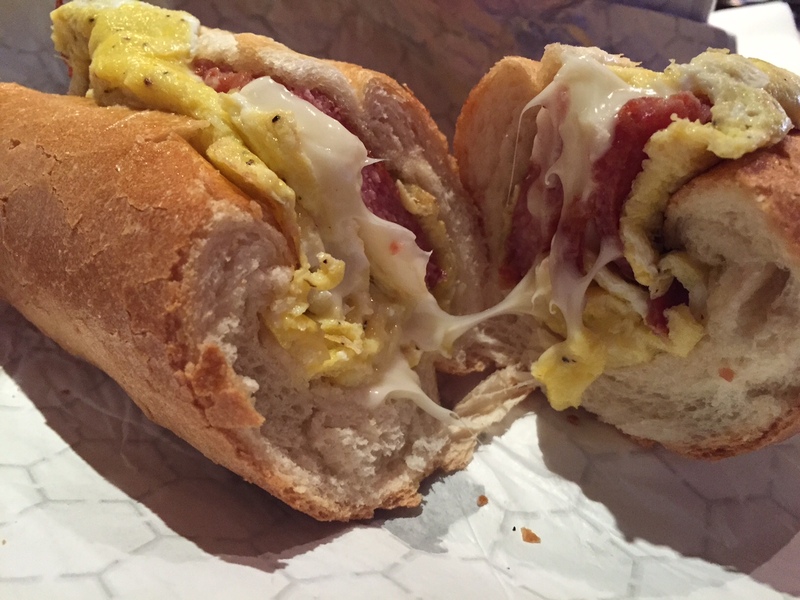 I had been talking to MDP about heading over to Hoboken to get a Taylor Ham sandwich some Saturday morning, and, per usual, he got down to scouring the internet for the ever-elusive-outside-of-New-Jersey tried and true Taylor Ham, egg, and cheese sandwich. He found Shorty’s, so we gave it a go today. If you too are searching for the beloved Taylor Ham, put Shorty’s at the top of your brunch list. When we got to the spot at five to 11, a sandwich board listing the Philly standards — roast pork, Italian fries, fresh-baked Philly bread, and, of course, cheeseteaks — greeted us, so we went inside. “Give us about five minutes,” called out the bartender, and we slid through the door as quickly as we had entered. Leaking air conditioners sprayed down on us for a good five until we decided it was okay to head back inside at 11:01. The Flatiron space is narrow and deep, with a bar running the length of the restaurant. Shorty’s offers just about every bourbon — even Blanton’s, which isn’t your run-of-the-mill Maker’s Mark — and a diverse selection of beers on tap. We sat at a high table that faced roughly five TVs and pored over the menu that doubled as a placemat. I appreciated the efficiency, which felt more New York City than Philadelphia. I had been planning to order the pork roll, egg, and American cheese on a roll since early last week. 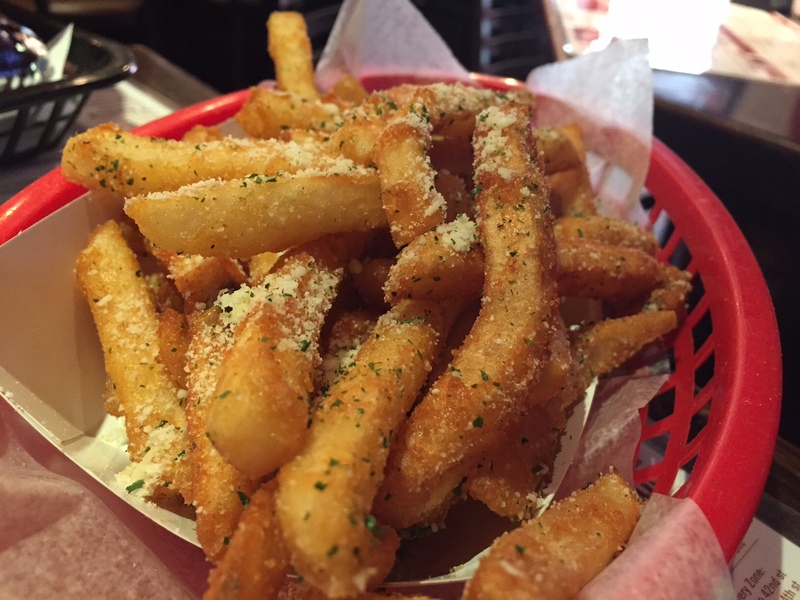 After much deliberation, MDP landed on the roast pork with provolone, and we opted for the Italian fries to share. Let’s start with the fries. Crisp and crusty, they were covered with Italian seasoning — whatever that means/probably oregano — and Romano cheese. I found them to be quite delicious and even verging on addictive, as the placemat/menu/restaurant storyboard suggests. I highly recommend these fries! Okay, so I was skeptical about the roast pork at first. Honestly, I don’t understand what it is. When I think about “roast pork,” I see something like a pork roast in my mind’s eye, but maybe I have it mixed up. I suppose, being from central/north Jersey, I’m not too familiar with some of the nuances of Philadelphia cuisine, including this particular sandwich. MDP said he had tried it a couple of times, but he owned up to being something less than an expert on it. “Here, why don’t you try it,” he said, gesturing with the sandwich. “No, it’s okay,” I said, shaking my head. But then I went ahead and took a bite. It was amaaaaazing. So tender, so flavorful. The texture of the bun was perfect, and the melted provolone brought the entire sandwich experience together. I highly recommend this sandwich at Shorty’s. As a side note, I should mention that Shorty’s ships their bread directly from Philadelphia. It sounds like they get the dough from the city of brotherly love and bake it on the NYC premises. I could be wrong, but, given Turnpike traffic and the prohibitive cost of Amtrak, I can’t imagine it’s literally fresh-baked from Philly. As you know, I’m a fan of Taylor Ham. It is this blog’s namesake and only brings back fond memories of sitting at the Mark Twain Diner from age 4 until well into my college years. So, I had high hopes for the pork roll, egg, and American cheese sandwich at Shorty’s. I was surprised when I received a foil-covered sub-shaped sandwich. Shouldn’t Taylor Ham exclusively be on a kaiser roll? But then I bit into the fresh “hoagie” roll. And I realized this must be what heaven is like. The compact feel of the sandwich delighted the senses. Though the pork roll was cut on the thicker side, it was delicious. I’m kind of down on eggs lately, but I liked them in this sandwich. As you can see, they were somewhere between scrambled and fried. And the melted cheese was a nice touch. I gobbled the whole thing down in about five minutes. And at $5, the sandwich couldn’t have had more value. Be aware that the Taylor Ham sandwich is only available at breakfast or brunch. Head to Shorty’s for brunch, lunch, dinner, drinks, sports — whatever! You’ll enjoy it no matter the reason you’re there. With four locations around the city, you have your pick at your convenience. But do try the Taylor Ham if you’ve never had it. Eating Taylor Ham in New York City is like seeing a dog walking on its hind legs while juggling — a very rare thing. Take advantage; go to Shorty’s. Check the website for other locations! Take the 6 to 28th Street and Park Avenue South, or N/R to 28th Street and Broadway.